The radical secular cultural elite have done everything they can to own the narrative; to indoctrinate the masses. In their condescension, these cultural elite look down on us as the “useful idiots” who are easily manipulated, as long as we remain engrossed in our televisions, internet, or any other of our many worldly distractions. All the cultural elite need do, they believe, is flash headlines that we catch as we get on with our worldly stuff. This is too easy, these elite seemed to think, until they tangled with a Bishop Morlino. Of course, this was, sadly, unique among most bishops and priests. Some of us actually succumbed to the indoctrination, while most of us remained timid and frightened of the backlash that would come from speaking up against the false narrative of the cultural elite. And, yes, the wolves pounced on Bishop Morlino whenever they felt they had an opening. Bishop put himself in harm’s way to protect his flock from the indoctrination, never considering the cost to himself. This made him a formidable opponent to the cultural elite. “They fear religion when it breaks loose.” Yes! This was the other half of this good bishop’s objectives. 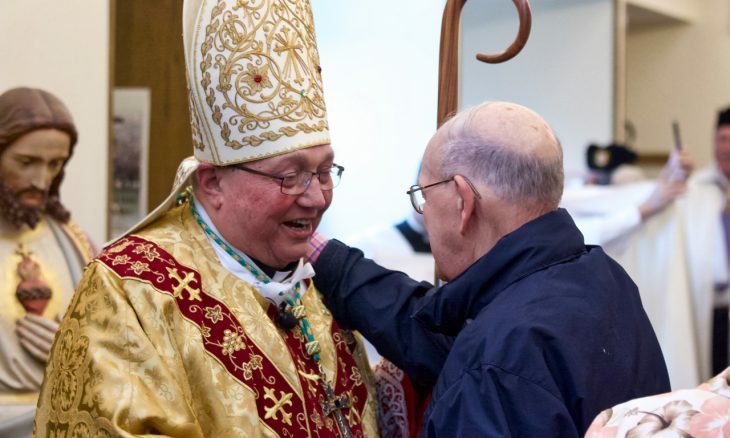 While Bishop Morlino remained strong and undaunted against this indoctrination, he worked very hard to draw this strength out in his flock; to have religion break loose in the Diocese of Madison. While Bishop encouraged the wide use of the Extraordinary Form of the Mass (he had his seminarians learn it), he did not insist upon it. I don’t really know if he hoped that, one day, the Catholic Church would revert to the Extraordinary Form, exclusively, but I do know he desired to see the Extraordinary Form enrich the offering of the Ordinary Form of the Mass. When it came to the Ordinary Form, Bishop was a strong proponent of ad orientem worship, the tabernacle centered in the sanctuary, Communion on the tongue while kneeling (he asked all First Communicants to receive this way), some Latin, and the use of sacred music versus most modern hymns. More to it, Bishop’s worst nightmare was to see any forms of elitism from the pews of either forms of the Mass. Bishop’s overall mission was to make Catholicism attractive and meaningful for all those who were searching for the deeper truths of life. Bishop Morlino was hungry for souls, and he was clear on how to fill the net. “Truth with Love” and “Awe and Wonder in Worship” were the two great ways Bishop Robert Morlino believed would reel in a multitude of fervent souls. And they did. Lord, grant us the bravery to carry on his mission and ever strive for these most worthy goals!